HOUSTON (July 28, 2015) – The Houston Symphony announced today that it has successfully recruited four new string musicians to be part of an initiative announced earlier this year to embed musicians more deeply in the community. The four musicians/educators will focus on enhancing the orchestra’s growing education and community engagement activities while also performing on stage for select Houston Symphonyperformances. Jenna Barghouti (violin), David D. Connor (double bass), Anthony Parce (viola), and Hellen Weberpal (cello) are part of the first group of Houston Symphony Community-Embedded Musicians who will spend most of their time in schools, neighborhoods and health care settings, beginning in the fall of 2015. Each one of these musicians is a practicing professional musician with the complementary skills and sensibilities of an educator, who will teach and engage people in learning experiences in, through, and about music. Among other new and expanded community activities, these musicians will be part of a music and wellness program aimed at increasing the quality of health care through music. In addition, they will be heavily involved in education programs targeted at improving problem solving, critical thinking, and essential life skills in students. All four Community-Embedded Musicians will perform on stage with members of the Symphony in approximately 25 concerts each year. The orchestra intends to add more of these musicians over the next two seasons, providing ever-increasing levels of service and music education to the rapidly growing Houston region. 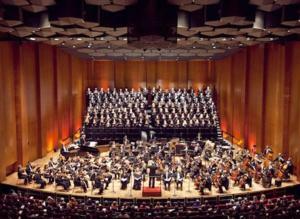 The creation and launch of the Community-Embedded Musicians program has been made possible through the early investment of generous supporters including the Spec’s Charitable Foundation, the Robert and Janice McNair Foundation, BBVA Compass and Mr. Monzer Hourani, all longtime leadership supporters of the Houston Symphony. In contrast to term-limited or structured fellowship or training programs, the new Community-Embedded Musicians are full-time, permanent, salaried employees of the Houston Symphony, and they will become part of the cadre of musicians who appear on stage and throughout the community. While existing Houston Symphony musicians spend about 80% of their time on stage as part of the orchestra’s robust schedule of classical, pops, family, student and community concerts, these Community-Embedded Musicians will do the opposite: They will devote the majority of their time to off-stage education and community programs through individual and small ensemble work in schools, neighborhoods and health care settings. These four individuals were selected after a rigorous month-long audition and interview process that drew more than 100 applicants from across the country. Candidates for these four new positions were required to be accomplished string players with a demonstrated passion and aptitude for education and community engagement work. Additionally, candidates who met the main qualifications and also spoke more than one language were highly encouraged to apply to help better reflect the diverse make up of Houston. The selection process involved live auditions before committees comprised of Houston Symphony musicians, classroom lesson demonstrations with students from Crespo Elementary School, and in-person interviews with administrative and musician leadership. Candidates were selected based on a combination of exceptional musical ability, passion for and experience doing work in the community and in educational settings, along with superior communication skills.